Following the Oath of Office Ceremony on January 15, a lunch will be held on the South Lawn of the Texas Capitol. Bring a Texas-sized appetite because Eddie Deen and his all-star team will be back again to bring the best in BBQ to the party. AUSTIN, Texas - Jan. 11, 2019 - PRLog -- Eddie Deen and his award winning team have been bringing the best in Texas BBQ to Inaugurations in the State for over two decades. In 1995, 14,000 guests were served for Gov. George W. Bush at his Gubernatorial Inaugural. In 1999, 15,500 guests were served at Gov. Bush second term inaugural on the Capitol Grounds. In 2001, over 10,000 guests were served at the Opening Ceremonies of the newly elected President George W. Bush. Also in 2001, at 3 Presidential Inaugural Balls held on the same night, 22,000 guests were served at the Washington DC Convention Center. 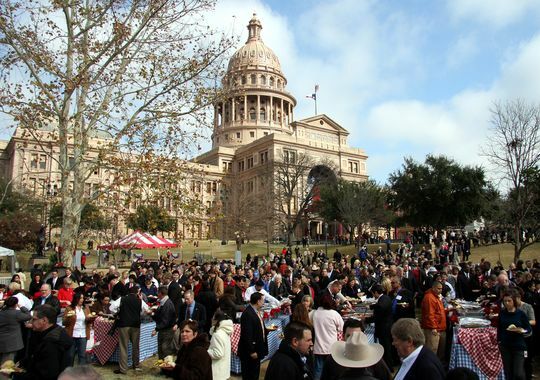 After Greg Abbott's first inauguration as Governor of Texas, Eddie Deen feed 17,000 hungry ticket holders clamoring for lunch on the Capitol grounds in Austin. Eddie Deen will be back again on January 15, 2019 to provide the best in BBQ meals to this year's crowd in Austin. Governor Greg Abbott commented, "Texas inaugurations are an opportunity for Texans to come together to reflect on our history and shared values." Serving barbecue at inaugurations and other political gatherings has been a long tradition in Texas history and Eddie Deen & Company Catering have definitely become part of that tradition. The company will be feeding 10,000 people for Greg Abbott's Gubernatorial Inauguration. They will be serving 5,000 lbs of brisket, 1,000 lbs of pulled pork, 1500 of grilled chicken breast, half a mile of kielbasa and jalapeño sausage, 300 gallons of potato salad, 300 gallons of pinto Beans, 200 gallons of cole slaw and 10,000 rolls. Eddie Deen grew up on a working ranch in Wills Point, Texas. From an early age, he learned the value of hard work, determination, and relationships. A 1979 graduate of Texas A & M University, Eddie opened his first restaurant on the shores of Lake Tawakoni in 1980. In 1994, he purchased the land and buildings for the "commissary" in Terrell, Texas which is now the main staging area for Eddie Deen & Company Catering. Millions of people all over the world have experienced unique parties and events catered by Eddie Deen. Currently, an average of 300,000 people are served each year at parties ranging from convention and corporate events, uniquely themed soirees, wedding rehearsals and receptions, and elegant social dinners. If you are not going to be at the Inauguration BBQ in Austin on the 15th, come join Eddie for a BBQ Party at Spicy Food Productions' ZestFest. Anyone who appreciates the hotter things in life is invited to indulge in a fiery food experience January 25-27, 2019 as ZestFest brings together the spiciest exhibitors and products from around the country for one sizzling weekend. ZestFest is proudly presenting Eddie Deens' Roasted Pig and BBQ Dinner on Saturday Jan. 28 at 6:00pm. Tickets for the dinner and the day sessions of ZestFest can be purchased at the ZestFest website ZestFest.net. Today Eddie has grown his catering business to include numerous companies and over 100 employees. From production, rentals, entertainment, two private event facilities, Deen's Crossroads, across from Cowboy Stadium, Smokey's BBQ Restaurant in Ft Worth , Jackson Street Restaurant in Kaufman. Eddie has packaged together a full-service event planning operation for any size party, any menu, any place…at any time. For the best in catered meals and special events you only have to remember four simple words… "Absolutely Texas, Absolutely Deen". For more about Eddy Deen visit http://eddiedeen.com/.